According to Bloomberg, Amazon's 3D phone that is about to be unveiled tonight, has been in the making at a secretive Lab126 compound for a while now, and is one of the longest hardware projects in development there. Amazon had to come up with something unique to stand out, as a "me too" approach in the cutthroat Android industry would be a recipe for disaster. Actually, interviews with lab insiders date Amazon's phone idea way back to 2009, and the engineers there have been toying with different ideas, when suddenly a Nintendo Wii feature gave them an inspiration. When you reverse the Wii's motion sensors, it turned out that you can move display objects around with your head movements, as in the video below, paving the way for a 3D phone without glasses. In fact, Amazon had two such projects, called Tyto and Otus, with the Otus one being a lower-cost version of the head-tracking phone. It wasn't before Jeff Bezos himself spent time in Lab126 last summer, however, until the Amazon phone, and the company's other hardware projects, really took off. Before that there were issues with finding the right cameras for the glasses-free 3D effect to take place, keeping cost under wraps, and mulling what exactly will be the benefit for consumers from this feature. Mr Bezos allegedly cracked down on the team, and we are about to see the final result today. 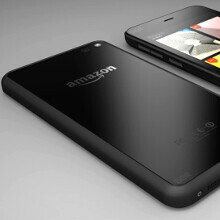 The project's codename was changed to Duke, and Amazon's phone is now expected to feature four tiny infrared cameras at the front, in addition to the standard front and rear cams. The infrared emitters will be used to bounce off beams from the user's pupils, track their movement, and adjust the image on the screen for the rumored 3D effect, or let you command the interface with gestures without touching the display. The underlying tech might be something similar to LG's Laser AF feature that beams infrared laser beams to the objects in front of the lens, calculates the precise distance, and focuses accordingly. Actually, Amazon already hinted about this head- and gesture-tracking feature of its upcoming AT&T-exclusive phone with the teaser video below. As to how exactly is the glasses-free 3D option executed in a way that is practical and beneficial, remains to be seen at the grand unveiling today, so stay tuned to PhoneArena for the festivities.